It has been rather cold overnight for the last couple of days and this had provided us with lots of learning opportunities! We began yesterday by simply bringing some ice, that had formed in a water filled barrel in the garden, inside for the kids to play with. They played with it for ages. They talked about solids and liquids, freezing and melting, how to melt it quicker (and then blowing on it) and probably much more that I can’t remember! But then of course they started to run out of ice. So they wanted more! I gave them the few remaining ice cubes we had in the freezer and we re-froze some of the pieces we still had left and this kept them going for a while longer. We did an experiment with hot and cold water and they discovered that ice melts quicker in hot water. 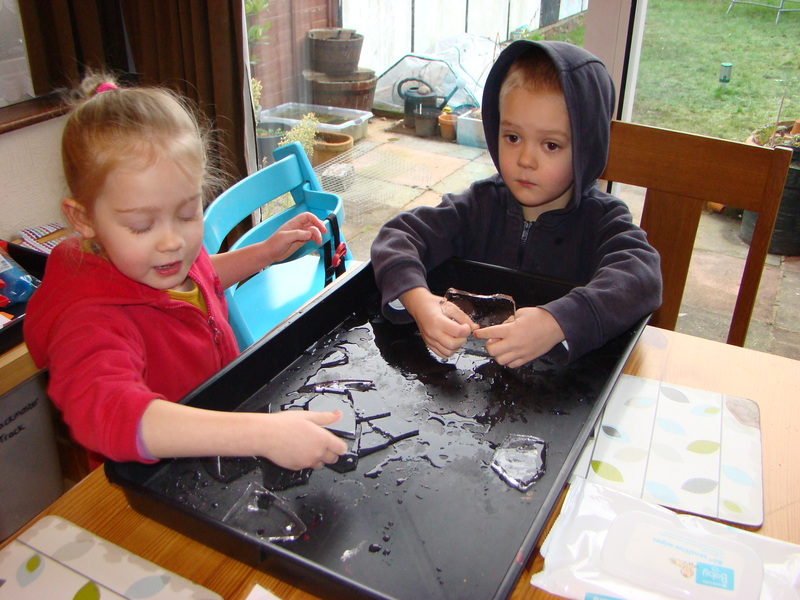 They also worked out that smaller pieces of ice melt quicker than larger ones. We talked about how to make ice and I gave them a small cup of water each to put in the freezer and make some themselves. We also filled 2 other containers with water and placed some small plastic toys in the water and then put these in the freezer as well. Then last night before they went to bed we filled 2 balloons with water and hung them outside. I also set up another experiment with 2 cups of water, one just water and one we added salt to, and these also went outside. Finally I put water in one of the gravel trays to cover the bottom and left this outside as well. And so today our ice play continued! We looked at the water/salt water cups and found that while the water had frozen, the salt water had not. 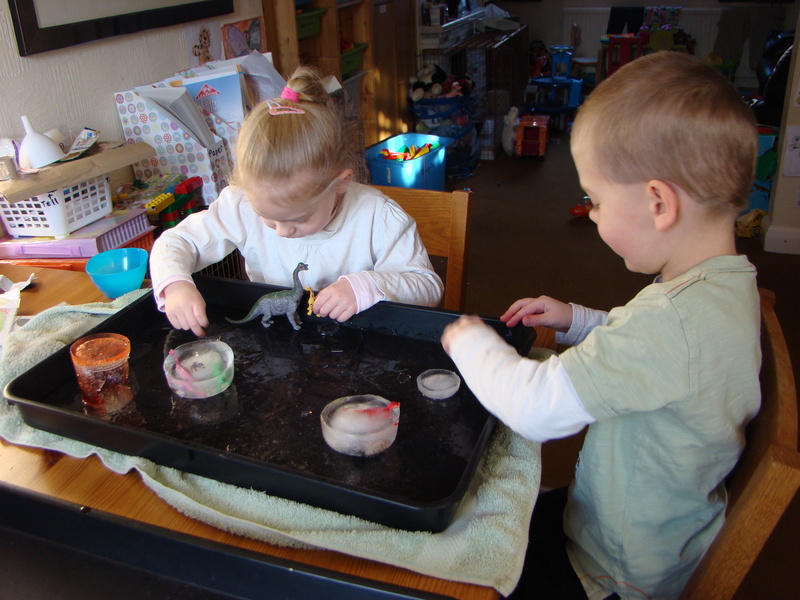 Then I got the gravel tray in and gave the kids the ice they had “made” yesterday (with and without toys in) and they spent a lot of time “pecking” at ice with toy dinosaurs! The dinosaurs lived on the icebergs and needed to rescue all sorts of friends! It was fabulous to see their imaginations in action! Towards the end the toy fish/sea creatures got added to the game as well and this gave me another idea. Tonight I have put the fish and other sea creatures in the gravel tray with a very thin covering of water and I am hoping that they will become frozen in ice, to be rescued tomorrow! We also still have our balloon ice marbles to play with tomorrow. They didn’t freeze so well outside last night (I think we put too much water in!) so they have been in the freezer all day today! Who would have thought that some frozen water could provide 2/3 days of activities!